Smart Talkers:Talking about children's communication from Small Talk SLT: A third of parents don't read a bedtime story! 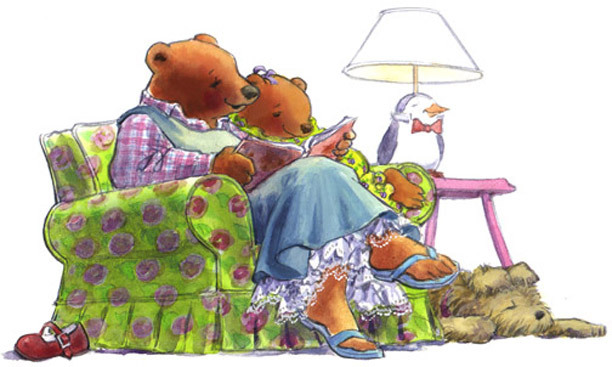 On Thursday, when I was on my way home, I heard a report on the radio about the fact that a third of parents are no longer reading their children a bed time story! I was both shocked and worried to hear such a report. The article states that some parents claim they do not have the time, or are to stressed to read to their children! In fact a parent said this to me last week. Yes, we do have very stressful and busy lives but, one story can open the door for a lot more opportunities for our children. We, as adults (parents, carers, early years practitioners, teachers etc) should be providing children with the opportunity to access books and stories, or even stories we make up ourselves. There are no rules or regulations to what we should read, how often, when or where; just take the opportunities while you can. For example, you may be waiting for the bus, you could read the advertisements on the bus and talk about what they might mean; or you may be having a coffee and you could look at a magazine or newspaper together. The possibilities to access written print and encourage language around it are endless. There are so many benefits to reading to children that I could just fill a whole page, and more telling you about it. However, instead of 'reinventing the wheel', please see links below for a previous blog written by Libby Hill; detailing and evidencing the benefits of reading to your child. In all of our pre- school language groups we always include a story. The children love it, and so do the parents. Whenever I look around the room I can see that parents are just as engrossed in the story, and will often laugh along. In fact, I often find that a story at the start of session can often act as a good 'ice breaker' for those children, and adults that find these situations difficult. I also like to choose a 'special helper' each week, and they get to choose a story for the group. So please, make it your resolution to include stories, and books into your everyday routine with the children you know! I would love to hear how you incorporate stories and books into you everyday life. It is such a bonding experience to read with your child or to them. As they get older there is less of it but I think when you have a child who does not like to read to themselves to have books still in their lives is wonderful. It takes their imaginations to wonderful places. It does not take long to read a story. I agree, its such a special time and its free! I miss reading to mine. Its rare even the 10 yo will let me now! one. A must reаd aгticle!